“Alaskan” redirects here. For other uses, see Alaskan (disambiguation). Alaska (/əˈlæskə/ ( listen); Aleut: Alax̂sxax̂; Inupiaq: Alaasikaq; Alutiiq: Alas’kaaq; Russian: Аляска, translit. Alyaska) is a U.S. state in the northwest extremity of North America, just across the Bering Strait from Asia. The Canadian province of British Columbia and territory of Yukon border the state to the east and southeast, its most extreme western part is Attu Island, and it has a maritime border with Russia (Chukotka Autonomous Okrug) to the west across the Bering Strait. To the north are the Chukchi and Beaufort seas—southern parts of the Arctic Ocean. The Pacific Ocean lies to the south and southwest. It is the largest U.S. state by area and the seventh largest subnational division in the world. In addition, it is the 3rd least populous and the most sparsely populated of the 50 United States; nevertheless, it is by far the most populous territory located mostly north of the 60th parallel in North America: its population—estimated at 738,432 by the United States Census Bureau in 2015— is more than quadruple the combined populations of Northern Canada and Greenland. Approximately half of Alaska’s residents live within the Anchorage metropolitan area. Alaska’s economy is dominated by the fishing, natural gas, and oil industries, resources which it has in abundance. Military bases and tourism are also a significant part of the economy. The name “Alaska” (Russian: Аляска, tr. Alyaska) was introduced in the Russian colonial period when it was used to refer to the Alaska Peninsula. It was derived from an Aleut-language idiom, which figuratively refers to the mainland. Literally, it means object to which the action of the sea is directed. Alaska is the northernmost and westernmost state in the United States and has the most easterly longitude in the United States because the Aleutian Islands extend into the Eastern Hemisphere. Alaska is the only non-contiguous U.S. state on continental North America; about 500 miles (800 km) of British Columbia (Canada) separates Alaska from Washington. 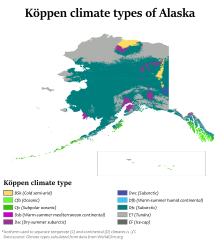 It is technically part of the continental U.S., but is sometimes not included in colloquial use; Alaska is not part of the contiguous U.S., often called “the Lower 48”. The capital city, Juneau, is situated on the mainland of the North American continent but is not connected by road to the rest of the North American highway system. The state is bordered by Yukon and British Columbia in Canada, to the east, the Gulf of Alaska and the Pacific Ocean to the south and southwest, the Bering Sea, Bering Strait, and Chukchi Sea to the west and the Arctic Ocean to the north. Alaska’s territorial waters touch Russia’s territorial waters in the Bering Strait, as the Russian Big Diomede Island and Alaskan Little Diomede Island are only 3 miles (4.8 km) apart. Alaska has a longer coastline than all the other U.S. states combined. Also referred to as the Panhandle or Inside Passage, this is the region of Alaska closest to the rest of the United States. As such, this was where most of the initial non-indigenous settlement occurred in the years following the Alaska Purchase. The region is dominated by the Alexander Archipelago as well as the Tongass National Forest, the largest national forest in the United States. It contains the state capital Juneau, the former capital Sitka, and Ketchikan, at one time Alaska’s largest city. The Alaska Marine Highway provides a vital surface transportation link throughout the area, as only three communities (Haines, Hyder and Skagway) enjoy direct connections to the contiguous North American road system. Officially designated in 1963. With its myriad islands, Alaska has nearly 34,000 miles (55,000 km) of tidal shoreline. The Aleutian Islands chain extends west from the southern tip of the Alaska Peninsula. Many active volcanoes are found in the Aleutians and in coastal regions. Unimak Island, for example, is home to Mount Shishaldin, which is an occasionally smoldering volcano that rises to 10,000 feet (3,000 m) above the North Pacific. It is the most perfect volcanic cone on Earth, even more symmetrical than Japan’s Mount Fuji. The chain of volcanoes extends to Mount Spurr, west of Anchorage on the mainland. Geologists have identified Alaska as part of Wrangellia, a large region consisting of multiple states and Canadian provinces in the Pacific Northwest, which is actively undergoing continent building. One of the world’s largest tides occurs in Turnagain Arm, just south of Anchorage, where tidal differences can be more than 35 feet (10.7 m). According to an October 1998 report by the United States Bureau of Land Management, approximately 65% of Alaska is owned and managed by the U.S. federal government as public lands, including a multitude of national forests, national parks, and national wildlife refuges. Of these, the Bureau of Land Management manages 87 million acres (35 million hectares), or 23.8% of the state. The Arctic National Wildlife Refuge is managed by the United States Fish and Wildlife Service. It is the world’s largest wildlife refuge, comprising 16 million acres (6.5 million hectares). Another 44 million acres (18 million hectares) are owned by 12 regional, and scores of local, Native corporations created under the Alaska Native Claims Settlement Act (ANCSA) of 1971. Regional Native corporation Doyon, Limited often promotes itself as the largest private landowner in Alaska in advertisements and other communications. Provisions of ANCSA allowing the corporations’ land holdings to be sold on the open market starting in 1991 were repealed before they could take effect. Effectively, the corporations hold title (including subsurface title in many cases, a privilege denied to individual Alaskans) but cannot sell the land. Individual Native allotments can be and are sold on the open market, however. The climate of Anchorage and south central Alaska is mild by Alaskan standards due to the region’s proximity to the seacoast. While the area gets less rain than southeast Alaska, it gets more snow, and days tend to be clearer. On average, Anchorage receives 16 in (41 cm) of precipitation a year, with around 75 in (190 cm) of snow, although there are areas in the south central which receive far more snow. It is a subarctic climate (Köppen: Dfc) due to its brief, cool summers. Numerous indigenous peoples occupied Alaska for thousands of years before the arrival of European peoples to the area. Linguistic and DNA studies done here have provided evidence for the settlement of North America by way of the Bering land bridge. At the Upward Sun River site in the Tanana River Valley in Alaska, remains of a six-week-old infant were found. The baby’s DNA showed that she belonged to a population that was genetically separate from other native groups present elsewhere in the New World at the end of the Pleistocene. Ben Potter, the University of Alaska Fairbanks archaeologist who unearthed the remains at the Upward River Sun site in 2013, named this new group Ancient Beringians. The Tlingit people developed a society with a matrilineal kinship system of property inheritance and descent in what is today Southeast Alaska, along with parts of British Columbia and the Yukon. Also in Southeast were the Haida, now well known for their unique arts. The Tsimshian people came to Alaska from British Columbia in 1887, when President Grover Cleveland, and later the U.S. Congress, granted them permission to settle on Annette Island and found the town of Metlakatla. All three of these peoples, as well as other indigenous peoples of the Pacific Northwest Coast, experienced smallpox outbreaks from the late 18th through the mid-19th century, with the most devastating epidemics occurring in the 1830s and 1860s, resulting in high fatalities and social disruption. The Aleutian Islands are still home to the Aleut people‘s seafaring society, although they were the first Native Alaskans to be exploited by Russians. Western and Southwestern Alaska are home to the Yup’ik, while their cousins the Alutiiq ~ Sugpiaq lived in what is now Southcentral Alaska. The Gwich’in people of the northern Interior region are Athabaskan and primarily known today for their dependence on the caribou within the much-contested Arctic National Wildlife Refuge. The North Slope and Little Diomede Island are occupied by the widespread Inupiat people. Some researchers believe that the first Russian settlement in Alaska was established in the 17th century. According to this hypothesis, in 1648 several koches of Semyon Dezhnyov‘s expedition came ashore in Alaska by storm and founded this settlement. This hypothesis is based on the testimony of Chukchi geographer Nikolai Daurkin, who had visited Alaska in 1764–1765 and who had reported on a village on the Kheuveren River, populated by “bearded men” who “pray to the icons“. Some modern researchers associate Kheuveren with Koyuk River. The Russian settlement of St. Paul’s Harbor (present-day Kodiak town), Kodiak Island, 1814. On March 30, 1867, the United States purchased Alaska from the Russian Empire for the sum of $7.2 million. It was not until October of that year that the commissioners arrived in Sitka and the formal transfer was arranged. The formal flag-raising took place at Fort Sitka on October 18, 1867. The original ceremony included 250 uniformed U.S. soldiers, who marched to the governor’s house at “Castle Hill”. Here the Russian troops lowered the Russian flag and the U.S. flag was raised. This event is celebrated as Alaska Day, a legal holiday on the 18th of October. William H. Seward, the United States Secretary of State, negotiated the Alaska Purchase (also known as Seward’s Folly) with the Russians in 1867 for $7.2 million. 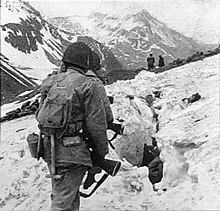 Alaska was loosely governed by the military initially, and was administered as a district starting in 1884, with a governor appointed by the President of the United States. A federal district court was headquartered in Sitka. For most of Alaska’s first decade under the United States flag, Sitka was the only community inhabited by American settlers. They organized a “provisional city government”, which was Alaska’s first municipal government, but not in a legal sense. Legislation allowing Alaskan communities to legally incorporate as cities did not come about until 1900, and home rule for cities was extremely limited or unavailable until statehood took effect in 1959. Starting in the 1890s and stretching in some places to the early 1910s, gold rushes in Alaska and the nearby Yukon Territory brought thousands of miners and settlers to Alaska. Alaska was officially incorporated as an organized territory in 1912. Alaska’s capital, which had been in Sitka until 1906, was moved north to Juneau. Construction of the Alaska Governor’s Mansion began that same year. European immigrants from Norway and Sweden also settled in southeast Alaska, where they entered the fishing and logging industries. Statehood for Alaska was an important cause of James Wickersham early in his tenure as a congressional delegate. Decades later, the statehood movement gained its first real momentum following a territorial referendum in 1946. The Alaska Statehood Committee and Alaska’s Constitutional Convention would soon follow. Statehood supporters also found themselves fighting major battles against political foes, mostly in the U.S. Congress but also within Alaska. Statehood was approved by Congress on July 7, 1958. Alaska was officially proclaimed a state on January 3, 1959. In 1960, the Census Bureau reported Alaska’s population as 77.2% White, 3% Black, and 18.8% American Indian and Alaska Native. The Alaska Heritage Resources Survey (AHRS) is a restricted inventory of all reported historic and prehistoric sites within the state of Alaska; it is maintained by the Office of History and Archaeology. The survey’s inventory of cultural resources includes objects, structures, buildings, sites, districts, and travel ways, with a general provision that they are over 50 years old. As of January 31, 2012[update], over 35,000 sites have been reported. In 2010, Alaska ranked as the 47th state by population, ahead of North Dakota, Vermont, and Wyoming (and Washington, D.C.). Estimates show North Dakota ahead as of 2018[update]. Alaska is the least densely populated state, and one of the most sparsely populated areas in the world, at 1.2 inhabitants per square mile (0.46/km2), with the next state, Wyoming, at 5.8 inhabitants per square mile (2.2/km2). Alaska is the largest U.S. state by area, and the tenth wealthiest (per capita income). As of November 2014[update], the state’s unemployment rate was 6.6%. As of 2018[update], it is one of 14 U.S. states that still has only one telephone area code. As of 2011[update], 50.7% of Alaska’s population younger than one year of age belonged to minority groups (i.e., did not have two parents of non-Hispanic white ancestry). The Alaska Native Language Center at the University of Alaska Fairbanks claims that at least 20 Alaskan native languages exist and there are also some languages with different dialects. Most of Alaska’s native languages belong to either the Eskimo–Aleut or Na-Dene language families however some languages are thought to be isolates (e.g. Haida) or have not yet been classified (e.g. Tsimshianic). As of 2014[update] nearly all of Alaska’s native languages were classified as either threatened, shifting, moribund, nearly extinct, or dormant languages. A total of 5.2% of Alaskans speak one of the state’s 20 indigenous languages, known locally as “native languages”. 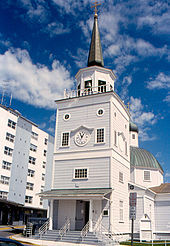 St. Michael’s Russian Orthodox Cathedral in downtown Sitka. Estimates for the number of Muslims in Alaska range from 2,000 to 5,000. The Islamic Community Center of Anchorage began efforts in the late 1990s to construct a mosque in Anchorage. They broke ground on a building in south Anchorage in 2010 and were nearing completion in late 2014. When completed, the mosque will be the first in the state and one of the northernmost mosques in the world. There’s also a Bahá’í Center. The 2007 gross state product was $44.9 billion, 45th in the nation. Its per capita personal income for 2007 was $40,042, ranking 15th in the nation. According to a 2013 study by Phoenix Marketing International, Alaska had the fifth-largest number of millionaires per capita in the United States, with a ratio of 6.75 percent. The oil and gas industry dominates the Alaskan economy, with more than 80% of the state’s revenues derived from petroleum extraction. Alaska’s main export product (excluding oil and natural gas) is seafood, primarily salmon, cod, Pollock and crab. The Trans-Alaska Pipeline transports oil, Alaska’s most financially important export, from the North Slope to Valdez. The heat pipes in the column mounts are pertinent, since they disperse heat upwards and prevent melting of permafrost. Alaska has vast energy resources, although its oil reserves have been largely depleted. Major oil and gas reserves were found in the Alaska North Slope (ANS) and Cook Inlet basins, but according to the Energy Information Administration, by February 2014 Alaska had fallen to fourth place in the nation in crude oil production after Texas, North Dakota, and California. Prudhoe Bay on Alaska’s North Slope is still the second highest-yielding oil field in the United States, typically producing about 400,000 barrels per day (64,000 m3/d), although by early 2014 North Dakota’s Bakken Formation was producing over 900,000 barrels per day (140,000 m3/d). Prudhoe Bay was the largest conventional oil field ever discovered in North America, but was much smaller than Canada’s enormous Athabasca oil sands field, which by 2014 was producing about 1,500,000 barrels per day (240,000 m3/d) of unconventional oil, and had hundreds of years of producible reserves at that rate. The Trans-Alaska Pipeline can transport and pump up to 2.1 million barrels (330,000 m3) of crude oil per day, more than any other crude oil pipeline in the United States. Additionally, substantial coal deposits are found in Alaska’s bituminous, sub-bituminous, and lignite coal basins. The United States Geological Survey estimates that there are 85.4 trillion cubic feet (2,420 km3) of undiscovered, technically recoverable gas from natural gas hydrates on the Alaskan North Slope. Alaska also offers some of the highest hydroelectric power potential in the country from its numerous rivers. Large swaths of the Alaskan coastline offer wind and geothermal energy potential as well. Alaska’s economy depends heavily on increasingly expensive diesel fuel for heating, transportation, electric power and light. Although wind and hydroelectric power are abundant and underdeveloped, proposals for statewide energy systems (e.g. with special low-cost electric interties) were judged uneconomical (at the time of the report, 2001) due to low (less than 50¢/gal) fuel prices, long distances and low population. The cost of a gallon of gas in urban Alaska today is usually 30–60¢ higher than the national average; prices in rural areas are generally significantly higher but vary widely depending on transportation costs, seasonal usage peaks, nearby petroleum development infrastructure and many other factors. Starting in 1982, dividends from the fund’s annual growth have been paid out each year to eligible Alaskans, ranging from an initial $1,000 in 1982 (equal to three years’ payout, as the distribution of payments was held up in a lawsuit over the distribution scheme) to $3,269 in 2008 (which included a one-time $1,200 “Resource Rebate”). Every year, the state legislature takes out 8% from the earnings, puts 3% back into the principal for inflation proofing, and the remaining 5% is distributed to all qualifying Alaskans. To qualify for the Permanent Fund Dividend, one must have lived in the state for a minimum of 12 months, maintain constant residency subject to allowable absences, and not be subject to court judgments or criminal convictions which fall under various disqualifying classifications or may subject the payment amount to civil garnishment. The Permanent Fund is often considered to be one of the leading examples of a “Basic income” policy in the world. Halibut is important to the state’s economy as both a commercial and sport fish. Alaskan agriculture has experienced a surge in growth of market gardeners, small farms and farmers’ markets in recent years, with the highest percentage increase (46%) in the nation in growth in farmers’ markets in 2011, compared to 17% nationwide. The peony industry has also taken off, as the growing season allows farmers to harvest during a gap in supply elsewhere in the world, thereby filling a niche in the flower market. Alaska, with no counties, lacks county fairs. 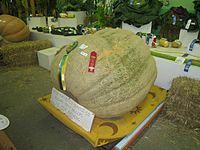 However, a small assortment of state and local fairs (with the Alaska State Fair in Palmer the largest), are held mostly in the late summer. 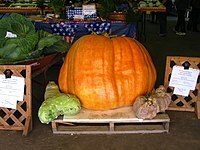 The fairs are mostly located in communities with historic or current agricultural activity, and feature local farmers exhibiting produce in addition to more high-profile commercial activities such as carnival rides, concerts and food. “Alaska Grown” is used as an agricultural slogan. Alaska’s reindeer herding is concentrated on Seward Peninsula, where wild caribou can be prevented from mingling and migrating with the domesticated reindeer. Most food in Alaska is transported into the state from “Outside”, and shipping costs make food in the cities relatively expensive. In rural areas, subsistence hunting and gathering is an essential activity because imported food is prohibitively expensive. Although most small towns and villages in Alaska lie along the coastline, the cost of importing food to remote villages can be high, because of the terrain and difficult road conditions, which change dramatically, due to varying climate and precipitation changes. The cost of transport can reach as high as 50¢ per pound ($1.10/kg) or more in some remote areas, during the most difficult times, if these locations can be reached at all during such inclement weather and terrain conditions. The cost of delivering a 1 US gallon (3.8 L) of milk is about $3.50 in many villages where per capita income can be $20,000 or less. Fuel cost per gallon is routinely 20–30¢ higher than the continental United States average, with only Hawaii having higher prices. Alaska has few road connections compared to the rest of the U.S. 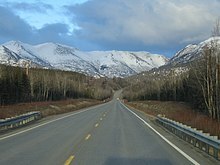 The state’s road system covers a relatively small area of the state, linking the central population centers and the Alaska Highway, the principal route out of the state through Canada. The state capital, Juneau, is not accessible by road, only a car ferry, which has spurred several debates over the decades about moving the capital to a city on the road system, or building a road connection from Haines. The western part of Alaska has no road system connecting the communities with the rest of Alaska. Built around 1915, the Alaska Railroad (ARR) played a key role in the development of Alaska through the 20th century. It links north Pacific shipping through providing critical infrastructure with tracks that run from Seward to Interior Alaska by way of South Central Alaska, passing through Anchorage, Eklutna, Wasilla, Talkeetna, Denali, and Fairbanks, with spurs to Whittier, Palmer and North Pole. The cities, towns, villages, and region served by ARR tracks are known statewide as “The Railbelt”. In recent years, the ever-improving paved highway system began to eclipse the railroad’s importance in Alaska’s economy. The railroad played a vital role in Alaska’s development, moving freight into Alaska while transporting natural resources southward (i.e., coal from the Usibelli coal mine near Healy to Seward and gravel from the Matanuska Valley to Anchorage). It is well known for its summertime tour passenger service. 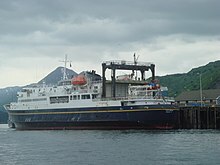 The MV Tustumena (named after Tustumena Glacier) is one of the state’s many ferries, providing service between the Kenai Peninsula, Kodiak Island and the Aleutian Chain. Alaska’s well-developed state-owned ferry system (known as the Alaska Marine Highway) serves the cities of southeast, the Gulf Coast and the Alaska Peninsula. The ferries transport vehicles as well as passengers. The system also operates a ferry service from Bellingham, Washington and Prince Rupert, British Columbia, in Canada through the Inside Passage to Skagway. The Inter-Island Ferry Authority also serves as an important marine link for many communities in the Prince of Wales Island region of Southeast and works in concert with the Alaska Marine Highway. In recent years, cruise lines have created a summertime tourism market, mainly connecting the Pacific Northwest to Southeast Alaska and, to a lesser degree, towns along Alaska’s gulf coast. The population of Ketchikan may rise by over 10,000 people on many days during the summer, as up to four large cruise ships at a time can dock, debarking thousands of passengers. Cities not served by road, sea, or river can be reached only by air, foot, dogsled, or snowmachine, accounting for Alaska’s extremely well developed bush air services—an Alaskan novelty. Anchorage and, to a lesser extent Fairbanks, is served by many major airlines. Because of limited highway access, air travel remains the most efficient form of transportation in and out of the state. Anchorage recently completed extensive remodeling and construction at Ted Stevens Anchorage International Airport to help accommodate the upsurge in tourism (in 2012–2013, Alaska received almost 2 million visitors). Many communities have small air taxi services. These operations originated from the demand for customized transport to remote areas. Perhaps the most quintessentially Alaskan plane is the bush seaplane. The world’s busiest seaplane base is Lake Hood, located next to Ted Stevens Anchorage International Airport, where flights bound for remote villages without an airstrip carry passengers, cargo, and many items from stores and warehouse clubs. In 2006 Alaska had the highest number of pilots per capita of any U.S. state. Another Alaskan transportation method is the dogsled. In modern times (that is, any time after the mid-late 1920s), dog mushing is more of a sport than a true means of transportation. Various races are held around the state, but the best known is the Iditarod Trail Sled Dog Race, a 1,150-mile (1,850 km) trail from Anchorage to Nome (although the distance varies from year to year, the official distance is set at 1,049 miles or 1,688 km). The race commemorates the famous 1925 serum run to Nome in which mushers and dogs like Togo and Balto took much-needed medicine to the diphtheria-stricken community of Nome when all other means of transportation had failed. Mushers from all over the world come to Anchorage each March to compete for cash, prizes, and prestige. 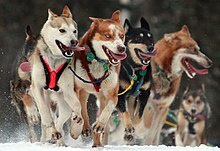 The “Serum Run” is another sled dog race that more accurately follows the route of the famous 1925 relay, leaving from the community of Nenana (southwest of Fairbanks) to Nome. In areas not served by road or rail, primary transportation in summer is by all-terrain vehicle and in winter by snowmobile or “snow machine”, as it is commonly referred to in Alaska. Alaska’s internet and other data transport systems are provided largely through the two major telecommunications companies: GCI and Alaska Communications. GCI owns and operates what it calls the Alaska United Fiber Optic system and as of late 2011 Alaska Communications advertised that it has “two fiber optic paths to the lower 48 and two more across Alaska. In January 2011, it was reported that a $1 billion project to connect Asia and rural Alaska was being planned, aided in part by $350 million in stimulus from the federal government. The center of state government in Juneau. The large buildings in the background are, from left to right: the Court Plaza Building (known colloquially as the “Spam Can“), the State Office Building (behind), the Alaska Office Building, the John H. Dimond State Courthouse, and the Alaska State Capitol. Many of the smaller buildings in the foreground are also occupied by state government agencies. Alaska’s court system has four levels: the Alaska Supreme Court, the Alaska Court of Appeals, the superior courts and the district courts. The superior and district courts are trial courts. Superior courts are courts of general jurisdiction, while district courts only hear certain types of cases, including misdemeanor criminal cases and civil cases valued up to $100,000. Alaska was formerly the only state in which possession of one ounce or less of marijuana in one’s home was completely legal under state law, though the federal law remains in force. Alaska’s voter initiative making marijuana legal took effect on February 24, 2015, placing Alaska alongside Colorado and Washington as the first three U.S. states where recreational marijuana is legal. The new law means people over age 21 can consume small amounts of pot – if they can find it. There is a rather lengthy and involved application process, per Alaska Measure 2 (2014). The first legal marijuana store opened in Valdez in October 2016. To finance state government operations, Alaska depends primarily on petroleum revenues and federal subsidies. This allows it to have the lowest individual tax burden in the United States. It is one of five states with no state sales tax, one of seven states that do not levy an individual income tax, and one of the two states that has neither (New Hampshire is the other one) The Department of Revenue Tax Division reports regularly on the state’s revenue sources. The Department also issues an annual summary of its operations, including new state laws that directly affect the tax division. While Alaska has no state sales tax, 89 municipalities collect a local sales tax, from 1.0–7.5%, typically 3–5%. Other local taxes levied include raw fish taxes, hotel, motel, and bed-and-breakfast ‘bed’ taxes, severance taxes, liquor and tobacco taxes, gaming (pull tabs) taxes, tire taxes and fuel transfer taxes. A part of the revenue collected from certain state taxes and license fees (such as petroleum, aviation motor fuel, telephone cooperative) is shared with municipalities in Alaska. In 2014 the Tax Foundation ranked Alaska as having the fourth most “business friendly” tax policy, behind only Wyoming, South Dakota, and Nevada. Alaska regularly supports Republicans in presidential elections and has done so since statehood. Republicans have won the state’s electoral college votes in all but one election that it has participated in (1964). No state has voted for a Democratic presidential candidate fewer times. Alaska was carried by Democratic nominee Lyndon B. Johnson during his landslide election in 1964, while the 1960 and 1968 elections were close. Since 1972, however, Republicans have carried the state by large margins. In 2008, Republican John McCain defeated Democrat Barack Obama in Alaska, 59.49% to 37.83%. McCain’s running mate was Sarah Palin, the state’s governor and the first Alaskan on a major party ticket. Obama lost Alaska again in 2012, but he captured 40% of the state’s vote in that election, making him the first Democrat to do so since 1968. The Alaska Bush, central Juneau, midtown and downtown Anchorage, and the areas surrounding the University of Alaska Fairbanks campus and Ester have been strongholds of the Democratic Party. The Matanuska-Susitna Borough, the majority of Fairbanks (including North Pole and the military base), and South Anchorage typically have the strongest Republican showing. As of 2004[update], well over half of all registered voters have chosen “Non-Partisan” or “Undeclared” as their affiliation, despite recent attempts to close primaries to unaffiliated voters. Because of its population relative to other U.S. states, Alaska has only one member in the U.S. House of Representatives. This seat is held by Republican Don Young, who was re-elected to his 21st consecutive term in 2012. Alaska’s at-large congressional district is one of the largest parliamentary constituencies in the world by area. In 2008, Governor Sarah Palin became the first Republican woman to run on a national ticket when she became John McCain‘s running mate. She continued to be a prominent national figure even after resigning from the governor’s job in July 2009. Alaska’s United States Senators belong to Class 2 and Class 3. In 2008, Democrat Mark Begich, mayor of Anchorage, defeated long-time Republican senator Ted Stevens. Stevens had been convicted on seven felony counts of failing to report gifts on Senate financial discloser forms one week before the election. The conviction was set aside in April 2009 after evidence of prosecutorial misconduct emerged. Republican Frank Murkowski held the state’s other senatorial position. 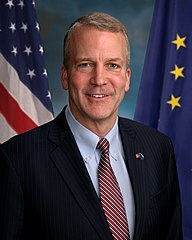 After being elected governor in 2002, he resigned from the Senate and appointed his daughter, State Representative Lisa Murkowski as his successor. She won full six-year terms in 2004, 2010 and 2016. Anchorage, Alaska, Alaska’s largest city. Fairbanks, Alaska’s second-largest city and by a significant margin the largest city in Alaska’s interior. 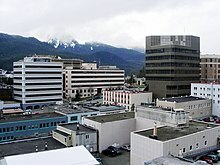 Juneau, Alaska’s third-largest city and its capital. 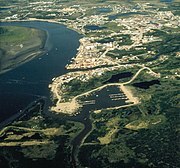 Utqiagvik (Browerville neighborhood near Eben Hopson Middle School shown), known colloquially for many years by the nickname “Top of the World”, is the northernmost city in the United States. Alaska is not divided into counties, as most of the other U.S. states, but it is divided into boroughs. Many of the more densely populated parts of the state are part of Alaska’s 16 boroughs, which function somewhat similarly to counties in other states. However, unlike county-equivalents in the other 49 states, the boroughs do not cover the entire land area of the state. The area not part of any borough is referred to as the Unorganized Borough. Whereas many U.S. states use a three-tiered system of decentralization—state/county/township—most of Alaska uses only two tiers—state/borough. Owing to the low population density, most of the land is located in the Unorganized Borough. As the name implies, it has no intermediate borough government but is administered directly by the state government. In 2000, 57.71% of Alaska’s area has this status, with 13.05% of the population. The state’s most populous city is Anchorage, home to 278,700 people in 2006, 225,744 of whom live in the urbanized area. The richest location in Alaska by per capita income is Halibut Cove ($89,895). Yakutat City, Sitka, Juneau, and Anchorage are the four largest cities in the U.S. by area. As reflected in the 2010 United States Census, Alaska has a total of 355 incorporated cities and census-designated places (CDPs). The tally of cities includes four unified municipalities, essentially the equivalent of a consolidated city–county. The majority of these communities are located in the rural expanse of Alaska known as “The Bush” and are unconnected to the contiguous North American road network. The table at the bottom of this section lists the 100 largest cities and census-designated places in Alaska, in population order. Of Alaska’s 2010 Census population figure of 710,231, 20,429 people, or 2.88% of the population, did not live in an incorporated city or census-designated place. Approximately three-quarters of that figure were people who live in urban and suburban neighborhoods on the outskirts of the city limits of Ketchikan, Kodiak, Palmer and Wasilla. CDPs have not been established for these areas by the United States Census Bureau, except that seven CDPs were established for the Ketchikan-area neighborhoods in the 1980 Census (Clover Pass, Herring Cove, Ketchikan East, Mountain Point, North Tongass Highway, Pennock Island and Saxman East), but have not been used since. The remaining population was scattered throughout Alaska, both within organized boroughs and in the Unorganized Borough, in largely remote areas. The Alaska Department of Labor and Workforce Development operates AVTEC, Alaska’s Institute of Technology. Campuses in Seward and Anchorage offer 1 week to 11-month training programs in areas as diverse as Information Technology, Welding, Nursing, and Mechanics. Alaska has had a problem with a “brain drain“. Many of its young people, including most of the highest academic achievers, leave the state after high school graduation and do not return. As of 2013[update], Alaska did not have a law school or medical school. The University of Alaska has attempted to combat this by offering partial four-year scholarships to the top 10% of Alaska high school graduates, via the Alaska Scholars Program. The Alaska State Troopers are Alaska’s statewide police force. They have a long and storied history, but were not an official organization until 1941. Before the force was officially organized, law enforcement in Alaska was handled by various federal agencies. Larger towns usually have their own local police and some villages rely on “Public Safety Officers” who have police training but do not carry firearms. In much of the state, the troopers serve as the only police force available. In addition to enforcing traffic and criminal law, wildlife Troopers enforce hunting and fishing regulations. Due to the varied terrain and wide scope of the Troopers’ duties, they employ a wide variety of land, air, and water patrol vehicles. Many rural communities in Alaska are considered “dry”, having outlawed the importation of alcoholic beverages. Suicide rates for rural residents are higher than urban. 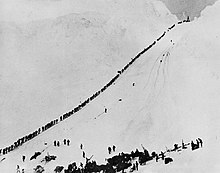 Some of Alaska’s popular annual events are the Iditarod Trail Sled Dog Race that starts in Anchorage and ends in Nome, World Ice Art Championships in Fairbanks, the Blueberry Festival and Alaska Hummingbird Festival in Ketchikan, the Sitka Whale Fest, and the Stikine River Garnet Fest in Wrangell. The Stikine River attracts the largest springtime concentration of American bald eagles in the world. The Alaska Native Heritage Center celebrates the rich heritage of Alaska’s 11 cultural groups. Their purpose is to encourage cross-cultural exchanges among all people and enhance self-esteem among Native people. The Alaska Native Arts Foundation promotes and markets Native art from all regions and cultures in the State, using the internet. There are many established music festivals in Alaska, including the Alaska Folk Festival, the Fairbanks Summer Arts Festival, the Anchorage Folk Festival, the Athabascan Old-Time Fiddling Festival, the Sitka Jazz Festival, and the Sitka Summer Music Festival. The most prominent orchestra in Alaska is the Anchorage Symphony Orchestra, though the Fairbanks Symphony Orchestra and Juneau Symphony are also notable. The Anchorage Opera is currently the state’s only professional opera company, though there are several volunteer and semi-professional organizations in the state as well. The official state song of Alaska is “Alaska’s Flag“, which was adopted in 1955; it celebrates the flag of Alaska. Alaska’s first independent picture entirely made in Alaska was The Chechahcos, produced by Alaskan businessman Austin E. Lathrop and filmed in and around Anchorage. Released in 1924 by the Alaska Moving Picture Corporation, it was the only film the company made. One of the most prominent movies filmed in Alaska is MGM‘s Eskimo/Mala The Magnificent, starring Alaska Native Ray Mala. In 1932 an expedition set out from MGM‘s studios in Hollywood to Alaska to film what was then billed as “The Biggest Picture Ever Made”. Upon arriving in Alaska, they set up “Camp Hollywood” in Northwest Alaska, where they lived during the duration of the filming. Louis B. Mayer spared no expense in spite of the remote location, going so far as to hire the chef from the Hotel Roosevelt in Hollywood to prepare meals. The 1983 Disney movie Never Cry Wolf was at least partially shot in Alaska. The 1991 film White Fang, based on Jack London‘s novel and starring Ethan Hawke, was filmed in and around Haines. Steven Seagal‘s 1994 On Deadly Ground, starring Michael Caine, was filmed in part at the Worthington Glacier near Valdez. The 1999 John Sayles film Limbo, starring David Strathairn, Mary Elizabeth Mastrantonio, and Kris Kristofferson, was filmed in Juneau. The forget-me-not is the state’s official flower and bears the same blue and gold as the state flag. ^ “State of Alaska”. Geographic Names Information System. United States Geological Survey. ^ “Median Annual Household Income”. The Henry J. Kaiser Family Foundation. Retrieved January 27, 2018. ^ “Elevations and Distances in the United States”. United States Geological Survey. 2001. Archived from the original on October 15, 2011. Retrieved October 21, 2011. ^ a b c “QuickFacts Alaska; United States”. 2018 Population Estimates. United States Census Bureau, Population Division. March 14, 2019. Retrieved March 14, 2019. ^ “Facts About Alaska, Alaska Kids’ Corner, State of Alaska”. alaska.gov. Retrieved 13 April 2018. Benson, Carl (September 2, 1998). “Alaska’s Size in Perspective”. Geophysical Institute, University of Alaska Fairbanks. Archived from the original on November 25, 2007. Retrieved November 19, 2007. ^ “Travel Information on South Central Alaska”. 2006. Retrieved April 22, 2011. ^ “1927: When Ketchikan was the Largest City in Alaska”. Sitnews US. April 30, 2007. Retrieved July 24, 2012. ^ Alaska Department of Transportation and Public Facilities. “The Alaska Marine Highway System” (PDF). Alaska Department of Transportation and Public Facilities. Archived from the original (PDF) on March 30, 2013. Retrieved April 21, 2012. ^ Alaska Channel. “Alaska Marine Highway”. Alaska.org. Alaska Channel. Retrieved April 21, 2012. ^ Alaska.com. “Alaska.com”. Alaska.com. Archived from the original on June 3, 2010. Retrieved June 2, 2010. ^ Porco, Peter (June 23, 2003). “Long said to be second to Fundy, city tides aren’t even close”. Anchorage Daily News: A1. ^ “Alaska Hydrology Survey”. Division of Mining, Land, and Water; Alaska Department of Natural Resources. ^ Group, Office of Communications – OC Web. “Glacier and Landscape Change in Response to Changing Climate”. www2.usgs.gov. Retrieved 2018-02-02. ^ “Beringglacier.org”. www.beringglacier.org. Retrieved 2018-02-02. 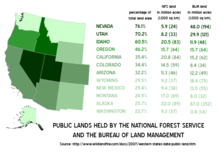 ^ “Western States Data Public Land Acreage”. Wildlandfire.com. November 13, 2007. Archived from the original on August 24, 2011. Retrieved June 2, 2010. ^ “Alaska Land Ownership”. Archived from the original on June 28, 2002. Retrieved May 4, 2014. ^ “Monthly Climate Summary, Ketchikan, Alaska”. Western Regional Climate Center. Retrieved February 7, 2013. ^ “Mean Annual Precipitation, Alaska-Yukon”. Spatial Climate Analysis Service. Oregon State University. February 2000. Retrieved June 5, 2012. ^ a b “NOAA Weather Radio All Hazards Information – Alaska Weather Interesting Facts and Records” (PDF). National Oceanic and Atmospheric Administration. Archived from the original (PDF) on September 29, 2006. Retrieved January 3, 2007. ^ a b “State Extremes”. Western Regional Climate Center, Desert Research Institute. Archived from the original on January 5, 2007. Retrieved January 3, 2007. ^ “SD Weather History and Trivia for May: May 1”. National Oceanic and Atmospheric Administration. Retrieved January 3, 2007. ^ “FAQ ALASKA – Frequently Asked Questions About Alaska: Weather”. Statewide Library Electronic Doorway, University of Alaska Fairbanks. January 17, 2005. Archived from the original on January 2, 2007. Retrieved January 3, 2007. ^ Ned Rozell (January 23, 2003). “The Coldest Place in North America”. 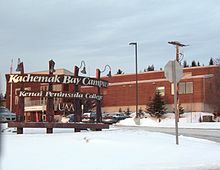 Geophysical Institute of the University of Alaska Fairbanks. Archived from the original on February 2, 2007. Retrieved January 3, 2007. ^ “Alaska climate averages”. Weatherbase. Retrieved November 1, 2015. ^ “Map of Human Migration”. ^ “Lost Native American Ancestor Revealed in Ancient Child’s DNA”. National Geographic. ^ Свердлов Л. М. Русское поселение на Аляске в XVII в.? “Природа”. М., 1992. No. 4. С.67–69. ^ Postnikov, Alexey V. (2000). “Outline of the History of Russian Cartography”. Regions: a Prism to View the Slavic Eurasian World. Archived from the original on January 17, 2013. Retrieved June 6, 2012. ^ Аронов В. Н. Патриарх Камчатского мореходства. // “Вопросы истории рыбной промышленности Камчатки”: Историко-краеведческий сб. – Вып. 3. – 2000. Вахрин С. Покорители великого океана. Петроп.-Камч. : Камштат, 1993. ^ Wheeler, Keith (1977). “Learning to cope with ‘Seward’s Icebox‘“. The Alaskans. Alexandria: Time–Life Books. pp. 57–64. ISBN 978-0-8094-1506-9. ^ “Alaska – Race and Hispanic Origin: 1880 to 1990”. U.S. Census Bureau. Archived from the original on December 24, 2014. Retrieved April 18, 2012. ^ “ALASKA Population of Counties by Decennial Census: 1900 to 1990”. Retrieved May 18, 2014. ^ Bureau, U. S. Census. “American FactFinder – Results”. factfinder.census.gov. ^ “Resident Population Data: Population Density”. U.S. Census Bureau. 2010. Archived from the original on October 28, 2011. Retrieved June 6, 2012. ^ “State Per Capita Income 2011” (PDF). Bureau of Economic Analysis, U.S. Department of Commerce. March 28, 2012. Retrieved June 6, 2012. ^ “Local Area Unemployment Statistics”. U.S. Bureau of Labor Statistics. December 26, 2014. Retrieved December 26, 2014. ^ “State Area Codes”. www.50states.com. ^ “American FactFinder”. Factfinder2.census.gov. October 5, 2010. Archived from the original on May 20, 2011. Retrieved May 29, 2011. ^ Exner, Rich (June 3, 2012). “Americans under age 1 now mostly minorities, but not in Ohio: Statistical Snapshot”. The Plain Dealer. ^ a b Population Division, Laura K. Yax. “Historical Census Statistics on Population Totals By Race, 1790 to 1990, and By Hispanic Origin, 1970 to 1990, For The United States, Regions, Divisions, and States”. Archived from the original on July 25, 2008. ^ “Population of Alaska – Census 2010 and 2000 Interactive Map, Demographics, Statistics, Quick Facts – CensusViewer”. censusviewer.com. ^ Center for New Media and Promotions(C2PO). “2010 Census Data”. census.gov. ^ “Language use in the United States, 2011” (PDF). Retrieved May 18, 2014. ^ a b “Languages, Alaska Native Language Center”. ^ Graves, K, PhD, MSW, Rosich, R, PhD, McBride, M, PhD, RN, Charles, G, Phd and LaBelle, J, MA: Health and health care if Alaska Native Older Adults. “Archived copy”. Archived from the original on January 28, 2014. Retrieved October 7, 2016. CS1 maint: Archived copy as title (link). In Periyakoil VS, eds. eCampus Geriatrics, Standford Ca, 2010. ^ “Alaska’s indigenous languages attain official status”, Reuters.com, October 24, 2014. Retrieved October 30, 2014. ^ “Bill History/Action for 28th Legislature HB 216”. The Alaska State Legislature. ^ “The Association of Religion Data Archives – State Membership Report”. www.thearda.com. Retrieved November 15, 2013. ^ “Religion in America: U.S. Religious Data, Demographics and Statistics – Pew Research Center”. Pew Research Center’s Religion & Public Life Project. May 11, 2015. ^ “The Association of Religion Data Archives – Maps & Reports”. thearda.com. ^ “Adherents.com”. Adherents.com. Archived from the original on May 5, 2010. Retrieved June 2, 2010. ^ “Believe it or not, Alaska’s one of nation’s least religious states”. Anchorage Daily News. July 13, 2008. Archived from the original on January 16, 2009. Retrieved July 23, 2008. 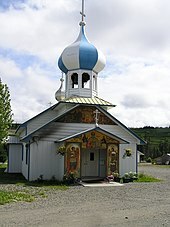 ^ “An early Russian Orthodox Church”. Vilda.alaska.edu. Retrieved June 2, 2010. ^ “Association of Religion Data Archive”. Thearda.com. Retrieved June 2, 2010. ^ Kalyan, Mala. “Shri Ganesha Mandir of Alaska”. Cultural Association of India Anchorage. Archived from the original on February 1, 2009. Retrieved September 26, 2009. ^ “Hindu Temples in USA – Hindu Mandirs in USA”. Hindumandir.us. Archived from the original on June 16, 2010. Retrieved June 2, 2010. ^ “Holi & Baisakhi celebrated by Alaskan Hindus and Sikhs”. Cultural Association of India Anchorage. Archived from the original on February 1, 2009. Retrieved September 26, 2009. ^ “First Muslim cemetery opens in Alaska”. Archived from the original on January 16, 2009. Retrieved August 30, 2008. ^ “Engaging Muslim: Religion, Culture, Politics”. Archived from the original on February 15, 2009. Retrieved August 30, 2008. ^ “Mosque milestone for Alaska Muslims – Americas”. Al Jazeera English. December 25, 2010. Retrieved May 29, 2011. ^ “Adults in Alaska”. Pew Research Center’s Religion & Public Life Project. May 11, 2015. ^ Frank, Robert. “Top states for millionaires per capita”. CNBC. Retrieved January 22, 2014. ^ “EIA State Energy Profiles: Alaska”. U.S. Energy Information Administration. March 27, 2014. Retrieved May 21, 2014. ^ “Rankings: Crude Oil Production, February 2013”. United States Energy Information Administration. Retrieved May 19, 2014. ^ “ND Monthly Bakken Oil Production Statistics” (PDF). North Dakota Department of Mineral Resources. Retrieved May 21, 2014. ^ “Crude Oil Forecast, Markets and Transportation”. Canadian Association of Petroleum Producers. June 2013. Retrieved May 21, 2014. ^ “Gas Hydrates on Alaska’s North Slope”. Usgs.gov. Archived from the original on June 1, 2010. Retrieved June 2, 2010. ^ “EIA State Energy Profiles: Alaska”. Tonto.eia.doe.gov. August 27, 2009. Archived from the original on November 3, 2010. Retrieved November 7, 2010. ^ “Screening Report for Alaska Rural Energy Plan” (PDF). April 2001. Archived from the original (PDF) on February 16, 2008. Retrieved April 11, 2006. ^ “Alaska Permanent Fund Corporation”. apfc.org. ^ “State of Alaska Permanent Fund Division”. Pfd.state.ak.us. Archived from the original on April 20, 2010. Retrieved June 2, 2010. ^ “Alaska’s Citizens’ Dividend Set To Be Near Highest Ever”. BIEN. Retrieved November 3, 2015. ^ “More than 1,000 New Farmers Markets Recorded Across Country as USDA Directory Reveals 17 Percent Growth – USDA Newsroom”. Usda.gov. August 5, 2011. Archived from the original on January 17, 2013. Retrieved June 14, 2012. ^ “Welcome to The Alaska Peony Growers Association”. Alaskapeonies.org. Retrieved June 14, 2012. ^ “Alaska Department of Fish and Game”. Adfg.alaska.gov. Archived from the original on June 24, 2011. Retrieved May 29, 2011. ^ “Reindeer Herding”. Reindeer.salrm.uaf.edu. Retrieved November 7, 2010. ^ “Daily Fuel Gauge Report”. Automobile Association of America. Retrieved May 18, 2013. ^ “Retail Fuel Pricing and News”. Oil Price Information Service. Retrieved May 18, 2013. ^ completion of the 3.5-mile (5.6 km) Interstate 93 tunnel as part of the “Big Dig” project in Boston, Massachusetts. ^ Barbara Yaffe (January 2, 2011). “Alaska Oil / BC Tar sands via rail”. Archived from the original on December 19, 2010. Retrieved January 2, 2011. ^ Allan Dowd (June 27, 2007). “Economic study touts Alaska-Canada rail link”. Reuters. Retrieved January 2, 2011. ^ AlaskaCanadaRail.org (January 2, 2005). “Alaska Canada Rail Link”. Archived from the original on April 25, 2011. Retrieved January 2, 2011. State of Alaska Office of Economic Development. Economic Impact of Alaska’s Visitor Industry Archived May 22, 2014, at the Wayback Machine Archived May 22, 2014, at the Wayback Machine Archived May 22, 2014, at the Wayback Machine. January 2014. Retrieved May 21, 2014. ^ “Norman Vaughan Serum Run”. United Nations. April 15, 2010. Archived from the original on March 3, 2009. Retrieved June 2, 2010. ^ Friedman, Sam (April 10, 2015). “Snowmachine or snowmobile? Whatever you call it, there’s a lot riding on it”. Fairbanks Daily Newsminer. Retrieved October 19, 2017. ^ “Alaska United Fiber Optic System homepage”. Alaskaunited.com. Retrieved July 24, 2012. Arctic fiber-optic cable could benefit far-flung Alaskans Archived January 11, 2012, at the Wayback Machine Archived January 11, 2012, at the Wayback Machine Archived January 11, 2012, at the Wayback Machine. Anchorage Daily News. ^ “State of Alaska Workforce Profile Fiscal Year 2013” (PDF). 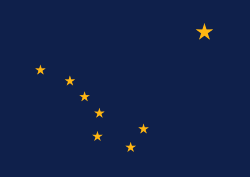 Dop.state.ak.us. Archived from the original (PDF) on March 30, 2014. Retrieved May 25, 2014. ^ a b c d “About the Alaska Court System”. State.ak.us. Archived from the original on September 13, 2009. Retrieved June 2, 2010. ^ Leip, David. “General Election Results – Alaska”. United States Election Atlas. Retrieved November 18, 2016. ^ “National Journal Alaska State Profile”. Election.nationaljournal.com. Archived from the original on November 15, 2006. Retrieved June 2, 2010. ^ Volz, Matt (July 11, 2006). “Judge rules against Alaska marijuana law”. The Seattle Times. Frank A. Blethen. Archived from the original on June 17, 2008. Retrieved May 22, 2008. ^ “Questions And Answers – About Alaskan Independence”. Alaskan Independence Party. 2006. ^ Chappel, Bill (February 24, 2015). “Marijuana Is Now Legal in Alaska, The 3rd U.S. State With Legal Pot”. Retrieved February 25, 2015. ^ CNN Money (2005). “How tax friendly is your state?” Retrieved from CNN website. ^ “How Friendly Is Your State’s Tax System? The Tax Foundation’s 2014 State Business Tax Climate Index”. The Tax Foundation. Archived from the original on July 12, 2010. Retrieved May 25, 2014. ^ “State of Alaska”. Gov.state.ak.us. Archived from the original on February 25, 2008. Retrieved June 2, 2010. ^ “Alaska Voter Registration by Party/Precinct”. Elections.alaska.gov. Retrieved January 9, 2019. ^ “Topic – Sarah Palin”. Washington Times. Retrieved May 25, 2014. ^ “Alaska Boroughs – “Official” sites”. Official Borough Websites. CountyState.Info. Retrieved September 13, 2007. ^ “Asset Building in Residence Life”. Alaska ICE. April 4, 2009. Archived from the original on October 9, 2007. ^ “AVTEC – Home Page”. Avtec.labor.state.ak.us. Retrieved September 7, 2012. ^ “UA Scholars Program – Frequently Asked Questions”. Archived from the original on March 9, 2008. Retrieved December 28, 2009. ^ “Alaska State Troopers Alaska Bureau of Alcohol and Drug Enforcement Control Board” (PDF). Dps.state.ak.us. Retrieved May 30, 2014. ^ “State of Alaska”. Hss.state.ak.us. Archived from the original on September 25, 2009. Retrieved June 2, 2010. ^ “Survey reveals higher rate of violence against Alaska women”. Archived from the original on May 31, 2014. Retrieved May 30, 2014. ^ D’oro, Rachel (January 30, 2008). “Rural Alaska steeped in sexual violence”. USA Today. Retrieved December 31, 2010. ^ “Alaska Native Arts Foundation”. 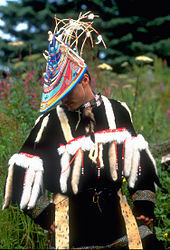 alaskanativearts.org. ^ “On Deadly Ground”. Filminamerica.com. Retrieved November 7, 2010. ^ Hopkins, Kyle (February 14, 2011). “Rating the Alaska reality shows: The best and the worst”. Anchorage Daily News. Archived from the original on March 2, 2013. Retrieved March 2, 2013. ^ “Alaska Conservation Foundation – State Symbols”. Archived from the original on February 25, 2009. Retrieved May 10, 2007. 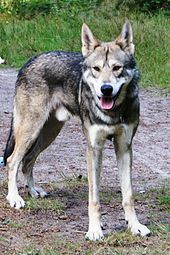 ^ “It’s official: Malamute now Alaska’s state dog”. KTUU.com, Alaska’s news and information source. May 13, 2010. Archived from the original on July 7, 2013. Retrieved June 2, 2010. ^ “State Soils”. USDA Natural Resources Conservation Service.